Since the 1980s, the retirement age has steadily risen from the late 50s to early 60s. In addition to longevity and health, the increase in retirement age is also due to the restructuring of pensions from defined benefit plans to defined contribution plans, making employees more responsible for their own retirement savings. An increasing number of older adults want and need to work longer, and forward-thinking employers have responded. They are creating inclusive environments for multi-generational workforces by recognizing this changing context of aging and work and outwardly valuing the experience, institutional knowledge, and commitment of older employees while adapting to new hire preferences. As the Director of an international, interdisciplinary network of scholars at the Sloan Research Network on Aging and Work at Boston College, I focus on scholarship that helps us understand what needs to happen so that older adults who need and want to work past traditional retirement ages can do so. Today, I’m sharing how employers can navigate a changing workforce to prioritize employees across at least four generations. If you want to provide an inclusive environment to workers of all ages, you must first find out what your employees want. What do they say they want to learn? What is their sentiment toward their own career advancement? What about their retirement plans? What support do they say they want from you to reach their financial, career and lifestyle goals? It may be easy to assume that people in their 60s are where they want to be, professionally. Some, of course, do want to phase into retirement but there are several others, especially women who may have started their careers later, who want to continue to further their careers. Use feedback surveys to get a pulse check on employee aspirations – it’s a perfect opportunity to ask them about their retirement goals and about how they see themselves growing professionally and personally within your organization. This data will inform your benefit and educational plan designs that meet employees where they are, but be sure to take every employees’ answers into consideration. Ignoring older worker sentiment because you’re assuming they’ve got one foot out the door is no longer a viable approach, especially considering that older employees are more likely to stay with a company than younger employees are. When we talk about diversity, age is not always included in that conversation, but it should be. The truth is, employees feel that “getting older” reflects negatively on their work aptitude, and a majority of them report experiencing some level of age discrimination. Talent leaders have an opportunity to rethink and combat such negative workplace experiences by encouraging and providing infrastructures that support multi-generational teams, cross-mentoring, cross-training and fostering dialogue through educational workshops about tackling explicit and implicit age bias. Include age in your diversity and inclusion efforts and make sure that hiring practices reflect this policy. Scan your job descriptions for subtle “codes” that could allude to age biases, create mixed age teams to interview candidates and enforce systematic processes to ensure candidate selection fairness. In multiple studies, we have found correlations between flexible work arrangements and employee productivity and engagement. Thanks to technology, employees of all ages and stages in life want more control over when, where, and how they want to work, not just the younger ones. Even though more organizations have installed flexible work arrangement policies and have put it on their books, employees are still not taking advantage of them because of lack of awareness or because of the stigma attached–that to want to work more flexibly indicates a lack of commitment to the organization. “Secret deals” negotiated between one manager and favored employees will only be met with resentment by others. Instead, adopt a policy that aligns with your organization and the different job types within it – one that works for everyone. Teach your staff how to request access, empower them to think through the impact their request has on their work, team and manager, and arm leadership with tools to respond appropriately. Such policies and programs, when implemented correctly, can be winning formulas and aid in recruitment and retention strategies for workers of all ages. Workers of all ages learn a lot from each other when organizational infrastructures allow for cross-generational collaboration. Mixed age teams, for example, are said to be more effective than homogeneously aged groups. In general, we find that programs such as flexible work options that are successful for one age group also benefit another. Consider including an affinity group or an ERG that brings together employees who consider themselves in their early, mid- or late-careers. Giving voice to a group of workers that considers the workforce implications of how employees define their unique career position or life stage can inform onboarding best practices, learning and development modalities, phased retirement programs and even how to welcome back retirees to maximize their institutional knowledge. In one example, a company matched an early-career group with an older leadership team to develop a social media strategy for the organization. This project sparked learning from both groups and facilitated conversations around the younger groups’ individual career ambitions. As a result, all of the younger employees were promoted within the year of this program and the leadership team completely changed their approach toward the marketing strategy. In an age of rising retirement ages, corporate strategy, HR and talent leaders must find creative ways to engage their workforce across generations. By asking employees what they need, by including “age” in diversity narratives, by providing systems that support cross-generational collaboration, by and creating a more inclusive hiring process, organizations will be better positioned to meet employees from all walks of life. 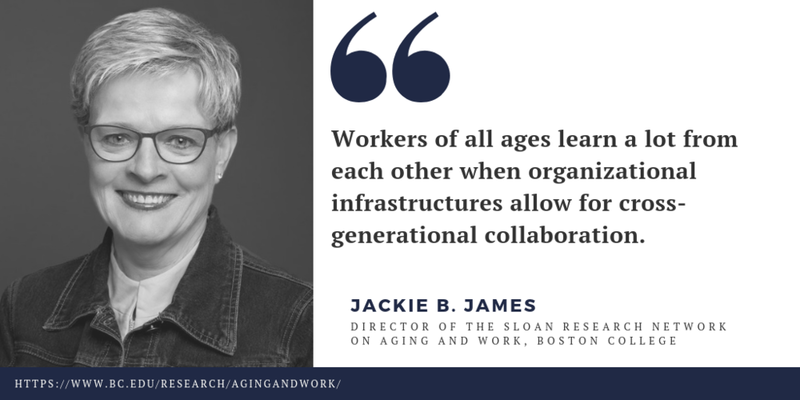 Jackie James is the director of the Sloan Research Network on Aging & Work at Boston College. Her research has focused on the meaning and experience of work, gender roles and stereotypes, adult development, perceptions of older workers and emerging retirement issues. She and her colleagues have published numerous articles, opinion pieces, and four edited books including a research brief called “The Prism of Age” that provides a framework to help employers use age diversity to their advantage. She is a past president of the Society for the Study of Human Development and serves on the editorial board of Work, Aging & Retirement.